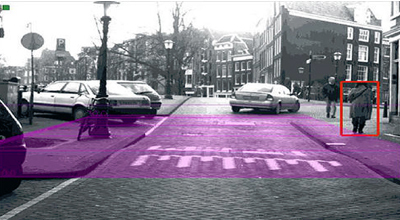 A newly developed system locates pedestrians in front of the vehicle using artificial vision. Soon to be integrated into the top-of-the-range Mercedes vehicles, the device includes two cameras and a unit that process information supplied in real time by all image points. The system was designed by a team of German researchers with the help of a lecturer at the University of Alcala (UAH, Spain). “The new system can detect pedestrians from within vehicles using visible spectrum cameras and can do so even at night,” said SINC David Fernandez Llorca, lecturer at the University of Alcala (UAH). Along with other scientists from the University of Heidelberg and the Max Planck Institute for Informatics, the researcher was involved in the new development for the prototypes of the company Daimler, which has research centres in Ulm (Germany). The newest feature of the device is the use of a dense stereo system. The term ‘stereo’ refers to the use of two cameras, which are 30cm apart in a structure below the rear-view mirror. “Human beings are able to make out the distance and depth of objects thanks to our two eyes—the same occurs with artificial vision,” explained the researcher. When information is collected from just some points, whether they may be very characteristic (like the edges or corners of an object), the term ‘non-dense’ is used. Dense stereo vision allows for a much more precise real time recognition of the surroundings in front of the vehicle (the shape of the road, the presence of pot holes and variations in contact between the vehicle and the road). In fact, pedestrian recognition is improved by a factor of up to 7.5 compared to non-dense systems. Animate objects can be detected in less that 200 milliseconds, like a child who suddenly runs across the road. The two cameras are connected to a processing unit that executes the artificial vision algorithm. The complex hardware has taken years to develop and is based on FPGA (Field Programmable Gate Array) technology ?" an electronic system with logic blocks that can be configured on-site using specialised language. Images can be seen live on a screen with ‘heads-up displays’ (front transparent screen) or through projections on the inner side of the windscreen. Different response elements can also be added to warn or assist the driver. These include alarms that warn of the presence of a pedestrian, break activation systems and even devices that take control of the wheel to avoid knocking someone down. “It is possible that we will see this pedestrian recognition system very shortly in the new, top-of-the-range Mercedes models,” says Fernandez Llorca. The study has been published in the IEEE Transactions on Intelligent Transportation Systems journal.